Do you know what your dream job is yet? Is community college helping you get there? 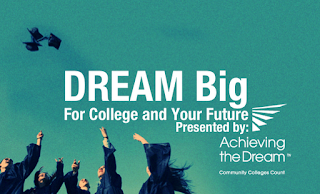 If the answer is yes then I want to encourage you to submit your story as part of Achieving the Dream's Dream Big for College Video Contest! First place will win $1500, second place $1000, and third place $500. Every bit helps, right? And the winner could be you! If you don't have something to create a video with, ask someone at the college to help you get in touch with their media department - if they hear you're submitting to this contest I'm sure they'll help by filming for you. Focus on the question, which in this case is telling how your community college is helping you move closer to your dream job. Tell your personal story, but always keep this topic in mind. Good luck and I hope you submit your story!